The five most recognised international university rankings demonstrate the growing strength of The University of Western Australia's research performance. The National Taiwan University Ranking (NTU) rankings first appeared in 2007. The ranking methodology has been relatively consistent since 2008 and is heavily reliant upon research output (Web of Science indexed articles). Within the NTU ranking there is no normalisation of citation data, which boosts the results of universities focused on medical and physical sciences, due to publication practices in those fields. Staff size is not taken into account in the ranking (although the NTU team does provide a separate score for each university which has been adjusted for size). Weighting of Performance Indicators. Note: The timeframe of the three long-term indicators is consistent with that in ESI, providing cumulative data for the last 11 years. The NTU Rankings have also expanded to include rankings by broad fields and specific subject areas for the top 300 universities in the world. NTU broad field ranking for UWA. NTU subject area for UWA. The ARWU first appeared in 2003. Although there have been some changes in the criteria used to rank universities, the ranking methodology has been fairly consistent since 2005. ARWU World Ranking for UWA. While the ARWU provides a list of the top 500 universities world wide, only the top 100 are provided with a ranked position. The remaining institutions are ranked in bands of either 50 or 100. However, as the ARWU provides a score for each indicator for all 500 universities, we are able to determine the ranked position of all institutions to a high degree of accuracy. In 2017, a new subject ranking was introduced, which expanded the subjects ranked from 5 to 52 and changed the methodology used to determine the rankings. In 2018 two new subjects were introduced bringing the total to 54. Subjects UWA ranked in the top 100. PUB is the number of papers authored by an institution in an Academic Subject during the period of 2011-2015. Only papers of 'Article' type are considered. Data are collected from InCites database. Papers in different Web of Science categories are grouped into relevant Academic Subjects (Classification of Web of Science Categories into Academic Subjects). International collaboration (IC) is the number of publications that have been found with at least two different countries in addresses of the authors divided by the total number of publications in an Academic Subject for an institution during the period of 2012-2016. Only papers of ‘Article’ type are considered. Data are collected from InCites database. TOP is the number of papers published in Top Journals in an Academic Subject for an institution during the period of 2012-2016. Top Journals are identified through Shanghai Ranking’s Academic Excellence Survey or by Journal Impact Factor. In 2018, 123 top journals selected by the Survey are used in rankings of 41 Academic Subjects. In Computer Science & Engineering, 14 selected top conferences are also taken into account this year. The list of the top journals and conferences can be found here. For Academic Subjects that do not have journals identified by the Survey, the JCR top 20% journals are used. Top 20% journals are defined as their Journal Impact Factors in the top 20% of each Web of Science category according to Journal Citation Report (JCR) 2016, and then aggregated into different Academic Subjects. Only papers of ‘Article’ type are considered. If a winner is affiliated with more than one institution at the time of winning the award, each institution is assigned the reciprocal of the number of institutions. If the award is awarded to more than one winner in one year, weights are set for winners according to their proportion of the prize. Different weights are set according to the periods of winning the prizes. The weight is 100% for winners in 2011-2015, 75% for winners in 2001-2010, 50% for winners in 1991-2000, and 25% for winners in 1981-1990. Key for subject rankings indicators. The QS (Quacquarelli Symonds) Ranking was introduced in 2005 and was conducted in conjunction with the Times Higher Education magazine until 2009. QS World Ranking for UWA. The QS ranking is based on six indicators, with 50% of the score determined by academics and business employers responses to reputation surveys. QS have excluded self-citations since 2011. In 2015, QS introduced a hybrid model where normalization is applied to citation totals at the faculty area level. Given that around 49% of global citations are in the Life Sciences & Medicine area, applying this adjustment made a substantial difference to the indicator and overall performance of certain institutions, including UWA. In 2016, QS excluded papers with more than 10 affiliated institutions. Data are pulled on a per-subject basis from the survey employed in the main ranking. Two h-indices are calculated; one for all the papers that are attributable to the given subject (h1), and one to the papers that are only attributable to that subject (h2). These are aggregated with double weight given to h2. The THE Ranking was introduced in 2005. Until 2009, Quacquarelli Symonds (QS) ran the rankings for the THE. The 2010 THE ranking had a new set of criteria and relied on information gathered from Thomson Reuters, as well as survey data and institutional statistics. The 2015 THE ranking moved from using Thomson Reuters to Scopus for the provision of data. Time Higher Education World Ranking for UWA. There has been some tweaking of the indictors since the introduction of the ranking in 2010 including an indictor for the level of international collaboration (judged using publication data in the WOS). The THE ranking utilises Z scores for all data sets except for the results of the academic reputation survey. Each data point is given a score based on its distance from the mean average of the entire data set, where the scale is the standard deviation of the data set. The Z-score is then turned into a "cumulative probability score" to arrive at the final totals. For the results of the reputation survey, the data are highly skewed in favour of a small number of institutions at the top of the rankings. In the 2012-13 ranking, THE introduced an exponential component to increase differentiation between institutions lower down the scale. In 2015, THE removed 649 papers with more than 1,000 authors from the citations indicator, which prevents individual very highly cited papers from skewing the citation score criteria of small institutions. Also in 2015, THE blended equal measures of a country-adjusted and non-country-adjusted raw measure of citations scores. THE argue that this presents a 'more rigorous approach to international comparison of research publications'. The move from Thomson Reuters to Scopus bibliometric assisted in UWA's significant rise in the 2015 ranking. At the time of the ranking Scopus covered significantly more Australian journals than Thomson Reuters, thereby increasing UWA’s score for papers per faculty member and citation scores. 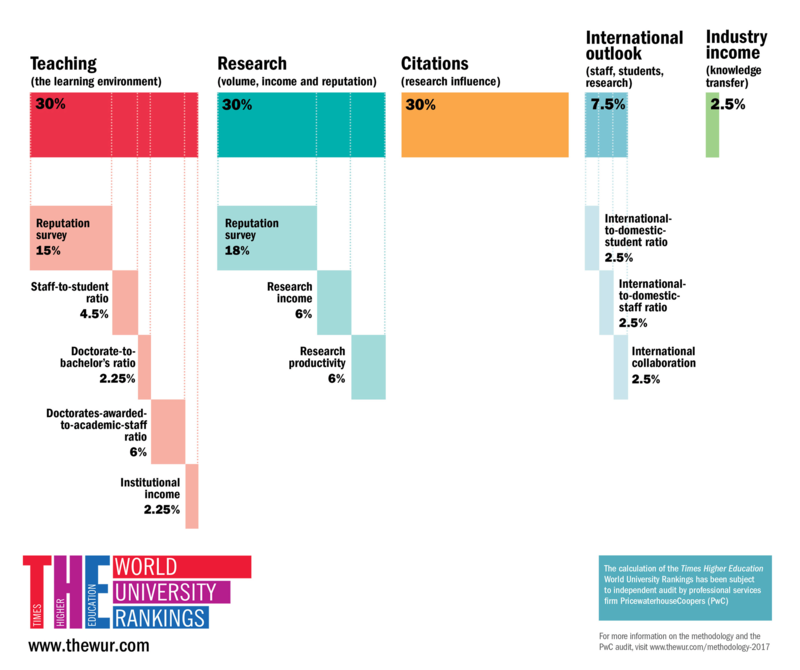 The world university rankings 2016-2017 methodology. THE also conducts rankings by subject areas, with UWA ranked in the top 100 in three key fields. UWA’s subjects ranked in the top 100. US News & World – the US newspaper famous for its annual ranking of American universities – launched a global ranking system in 2014. In 2018, the ranking has refined its methodology each year since its inception; therefore, this year's results are not directly comparable to previous years'. Compared to the QS and THE rankings, the US News and World methodology has a greater focus on research, but still includes a reputational survey component. US News & World Ranking for UWA. Subject areas ranked in the top 200.